“As the gig economy kicked off in 2013, it also looked like a potential solution for another pressing problem, which was that, even as many workers were struggling to juggle intense jobs with other responsibilities, a significant portion of the population was having trouble finding a job at all” (p.60). By following the stories of a few different characters in this book, we see people from different backgrounds and social locations become enchanted by the promise of the gig economy, to (for many people) being disappointed or outright exploited through the gig economy. For example, we meet Abe who has a goal of becoming rich, and starts working for Uber to get closer to that goal, and eventually tries to organize protests and strikes against Uber because of its treatment of drivers and its low wages. In addition, we meet Terrence who struggles to find a job and then secures a position with an organization called Samaschool teaching job skills to members of his community. When he begins his role he is excited about the possibility of uplifting his community, but he struggles in his role because the barriers to employment for the people in his classes are not easily solvable with a few classroom sessions, and the number of people who actually gain employment after the Samaschool classes are few. We also meet Kristy who needs to support her family after her husband is laid off from his job, but has limited skills and few educational credentials to be able to do that. Kristy finds Amazon’s Mechanical Turk platform and uses it to make money to support her family. However, because the platform pays minuscule amounts, this mode of making money requires that she find ways to “become efficient” on the platform, find the best jobs on the platform and eventually move onto better work. On the opposite end of the spectrum, we meet Craig , a white, male, educated programmer who is frustrated with the bureaucracy of the company he works for, wants to be able to do his highly skilled work from anywhere and so quits to work for a company that gives him freelance contracts. Not only does he manage to create a schedule that is much more flexible, but he is able to match his previous salary, diversify and strengthen his skills, do much more fulfilling work, learn new things and ultimately find his dream job with Elon Musk. And finally, we meet Dan and Saman, two entrepreneurs who are building a cleaning company that originally is based on a “Uber for Cleaning” model but later moves from a model of hiring contractors to hiring employees because the transitory nature of contractors negatively impacted their business. 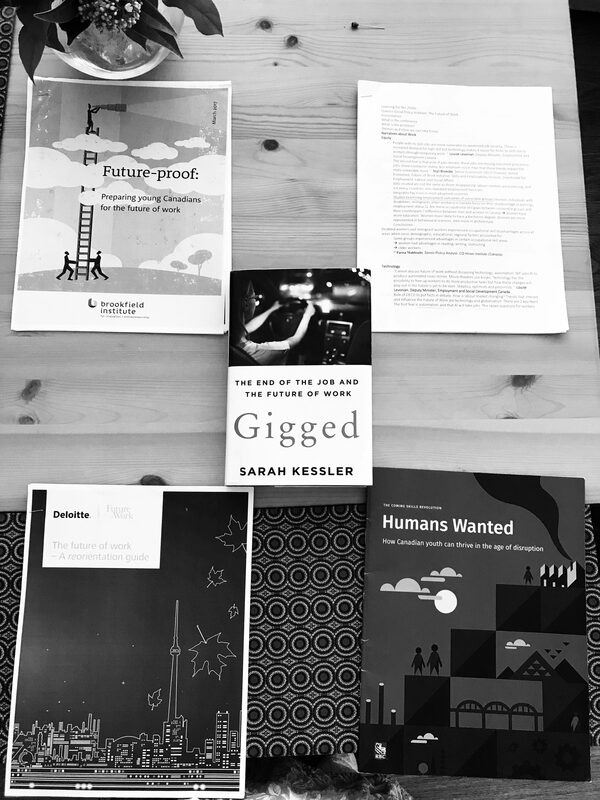 Each person depicted in this book has a different experience of the gig economy based on their lived experiences and positionality, and through sharing these stories from very different parts of the system (from low-skilled worker, to highly skilled freelancer, to employer and more), Kessler conveys a sense of the possibilities and problems of the gig economy. In the absence of employee benefits, how do we ensure protection for workers in the gig economy who are involved in precarious work? This book largely speaks about the US, but there are interesting ideas presented here that matter for Canada too. Kessler notes that the gig economy is not wonderful for everyone, and in fact, “workers in the gig economy are disproportionally poor” (p.86). Though independent work can help highly skilled workers, low-wage earners are generally hurt instead of helped by the move from employees to independent workers, because they have lower wages overall, experience more job instability and are less likely to receive benefits (p.87). One idea discussed in the book (and at the Queens Policy Institute) was mobile benefits that are connected to the worker rather than their job. As of the book’s publication there are no “live” functional versions of this policy/program, and many possible prototypes have died before becoming reality, but I’m curious if there are feasible versions of mobile benefits in Canada. 2. When jobs are disappearing and teaching “job skills” or “career skills” in a ten-week course (or a one time workshop) do not seem to help, how can we advocate and support deeper interventions to help individuals in their search for good decent work? This book highlights that a challenge with the “Future of Work” conversation is that your positionality really matters. “He had come to more fully appreciate how drastically uneven Dumas’s patch of the playing field really was. Fifteen percent of adults in Dumas had never graduated high school. Terrence was trying to teach some of his students how to write an online resume profile when they hadn’t been taught to write persuasively at all. He was trying to teach them to decipher online job postings when they struggled with reading comprehension” (p.115). In addition to addressing the digital divide and the gap in skills between workers in the gig economy, these stories highlight that it is important to think about the narratives of success and persistence that underpin our narratives of the changing world of work. This book makes it clear that it is a disservice to talk about persistence without addressing barriers to success. And so the question arises: Rather than simply teaching people job hunting skills, how do we alter their access to the world of work (making childcare more affordable, making transit more accessible for example), improving access to trades and local employment opportunities, and making specific and broad interventions to create more equal societies? Without doing these broader changes, job skill programs have limited utility. 3. How are we facilitating conversations about good work, good jobs, and benefits with young workers? In Canada, the Atkinson Foundation has the “Just Work It” platform for podcasts and live events about decent work for and by millenials, The Urban Workers Project offers resources to help individuals succeed as independent worker and organizes campaigns to advocate for better work, but far more broadly, we need to talk with young people about the future of work and they can do to protect themselves in precarious times. “Applying for gigs on platforms like Upwork was just like applying for any job. It took a lot of effort, and it was rife with similar discrimination and sources of inequality. To Terrence’s students, the constant failure to get gigs was paralyzing. Spending hours applying for gigs to no avail is one thing when you’re not desperate for money and pretty sure that you have other options. All work and no pay is an entirely different experience when you can’t afford to work for free” (p.119). “Even when Terrence helped students with their portfolios, they almost never got an interview” (p. 119) and in fact, even when Samaschool moved from just job finding skills to actually teaching students skills, still only a few students found work. Then they paid students to have internships and still only a limited number of students found work (p. 122). I’ve been reading the work of Tristram Hooley and Ronald Sultana recently, and Hooley’s recent piece on emancipatory career guidance resonated deeply with me. The emancipatory approach argues that instead of simply talking about individual steps to career success, a discussion of opportunity structures, (the idea that our career experiences and opportunities are influenced by and shaped by social structures) needs to be made explicit. And this perhaps is my take-home reflection from Gigged: to move honestly and bravely into this new world of work that is constantly unfolding, we need to have discussions as employers, jobseekers and researchers about race, privilege, and inequality and then bring these learnings into our discussions and policy interventions to help not simply young people, but all individuals find good, meaningful work in the years to come.